Benchtop cleaning of PCBs is a tough challenge for process engineers. Dip-and-brush is a cheap but slow cleaning method that often leaves residues to migrate across circuits. Traditional high-pressure aerosols are convenient but can be expensive. 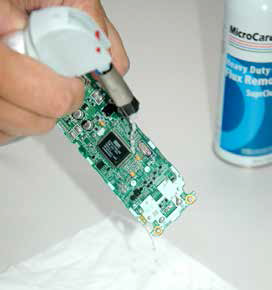 Here at Murray Percival we supply MicroCare, a product that offers a better way to clean circuit boards. There is a large PCB repair depot near Minneapolis (USA) that has tested this for themselves. This company cleans and repairs the “brains” of point-of-sale systems used in stores. These computers have a hard life but must function reliably despite the abuse they might receive. A POS system can get dropped on a floor or drowned in a sugary drink. When they fail, credit card transactions come to a screeching halt. This is a tough pill to swallow for retailers whose customers no longer carry cash. For years, this company cleaned their boards with a traditional, high-pressure aerosol. But consumption was high and the cleanliness was not great. MicroCare offered the patented TriggerGrip™ system along with Heavy-Duty Flux Remover – SuprClean™. After the test the process engineer noted, “The MicroCare product does a superior job. The TriggerGrip™ system allowed technicians to clean precisely without waste while lowering worker exposures to chemical fumes. It localizes the cleaning to the area of the repaired area of the PCB, which prevents flux from migrating across the board. The benchtop cleaning process becomes standardized, with a consistent quantity of liquid dispensed for each repair. With the TriggerGrip™ system and SuprClean™ “it is much less work to remove the flux,” the engineer added. ‹ Here we go again! Murray Percival Company Host BEST IPC Training.